Los Angeles, Calif. (January 30, 2017) — BOOM! Studios is proud to announce THE NOT-SO SECRET SOCIETY, an all new multi-platform graphic novel experience! The writing team of Matthew Daley (Lantern City) and Arlene Daley call on twenty-five years of combined education experience to create this thrilling, coming-of-age adventure which premieres today with free, weekly mini-comics and activities at www.teamNS3.com and arrives in a full-length original graphic novel this summer. “We set out to write a book that celebrates a spirit of adventure, the boundless possibilities of science and imagination, and inclusion—things that are more important than ever,” said Matthew Daley. Madison, Dylan, Emma, Aidan, and Ava have pretty normal lives for a group of twelve-year olds: they go to school, participate in extracurricular activities, and, oh yeah, they also have AWESOME ADVENTURES. Together they form The Not-So Secret Society (also known as NS3). But when they invent a candy-making machine for their school’s annual science fair, things don’t go according to plan...and their candy creation comes to life and escapes, threatening to destroy the entire city! 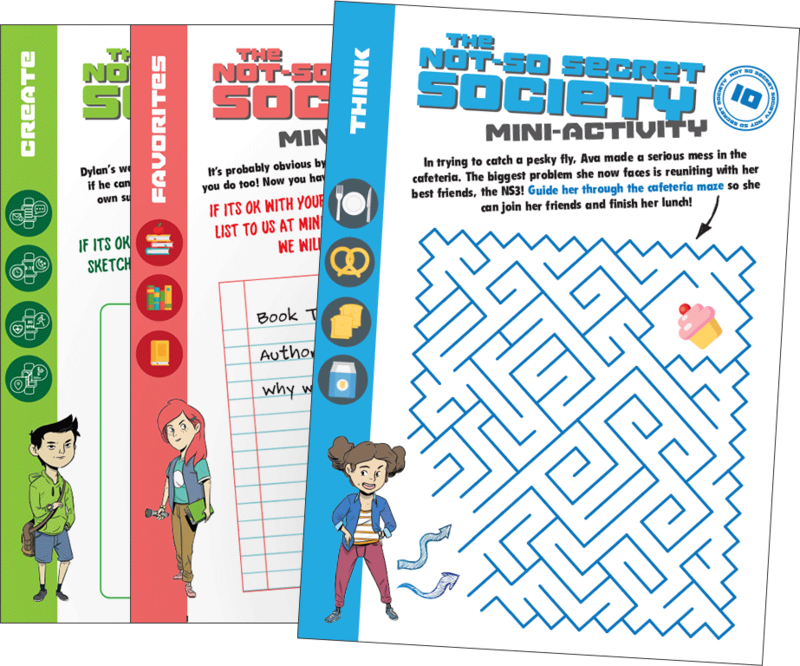 With their strong background in education and experience as parents, the creator team behind The Not-So Secret Society have made targeted resources to go with the comic for teachers and librarians. Co-created by Macrocosm’s Trevor Crafts (Lantern City) and Ellen Crafts, and illustrated by Wook Jin Clark (Adventure Time: The Flipside), The Not-So Secret Society is an all-ages adventure that celebrates the value of teamwork and lifelong friendships. This all-new original graphic novel is the latest release from BOOM! Studios’ KaBOOM imprint, home to popular all-ages series such as Steven Universe and Adventure Time, inspired by their respective hit animated series on Cartoon Network; The Deep by Tom Taylor and James Brouwer, which has become a hit animated series on Netflix; Brave Chef Brianna by Sam Sykes and Selina Espiritu; and Mega Princess by Kelly Thompson and Brianne Drouhard. For more on The Not-So Secret Society, check out www.teamNS3.com for the first chapter of the free, weekly mini comics PLUS a printable NS3 activity and more right now! Macrocosm (macrocosm.tv) is a new voice in transmedia entertainment. The award winning Macrocosm brings dynamic engaging content to global audiences. Films include the upcoming documentary on the origins of Sesame Street "Street Gang" and “Experimenter” a 2015 Sundance Film Festival hit and critical darling. Creator of “Lantern City” (lanterncitytv.com), Macrocosm published the illustrated novel “Rise” in 2013 and in 2014 partnered with BOOM! Studios, to create the “Lantern City” comic book series, one of UPROXX Top Ten Comics of 2015. Founded by Ross Richie in 2005, Diamond Gem Award-winning “Best Publisher” BOOM! Studios (boom-studios.com) generates New York Times best-selling Eisner and Harvey Award-winning comic books and graphic novels. BOOM! Studios is comprised of four distinct imprints: The "Studios" imprint is home to The Woods, Grant Morrison's Klaus, and Big Trouble in Little China. Imprint "BOOM! Box" publishes Lumberjanes, Steve Jackson Games' Munchkin, and Giant Days. All-Ages imprint "KaBOOM!" publishes Charles M. Schulz’s Peanuts, Jim Davis’ Garfield; and Cartoon Network’s Adventure Time. And the "Archaia" imprint is home to Mouse Guard, Cow Boy, and numerous Jim Henson Company properties. Since 2013, BOOM! Studios has had a unique first-look feature film relationship with 20th Century Fox and since August 2014 BOOM! has had a similar first-look relationship with Fox's television studio to develop properties for the small screen.